Go along with you!, Go away !, Go fly a kite!, Go on ! We sometimes go to the sea. 我々は時々海へ出かける. He has gone to France. 彼はフランスへ行ってしまった 《★【用法】 have gone は「行ってしまって今ここにいない」ことを表わすが, 《米》 では「行ったことがある」の意にも用いる; cf. have been (⇒been 自動詞 1b 【用法】 (2) (3))》. 〔+to+(代)名詞〕(活動などに従事するために)〔場所へ〕行く，通う 《★【用法】 施設・種類などを表わす時は冠詞がつき，可算名詞 であるが，その「目的」を表わす時には名詞は無冠詞で 不可算名詞》. go to school [church, market] 学校[教会, 市場]へ行く. go to bed 就寝する, 寝る. go to a vocational school [a private school] 職業学校[私立学校]へ通う. I went to his lecture. 彼の講義に出た. go on a journey [hike, walk, demo, visit] 旅に出る[ハイキングに行く, 散歩に出る, デモに行く, 訪問に行く]. go for a drive [walk, swim] ドライブ[散歩, 泳ぎ]に出かける. 〔+doing〕〈…しに〉行く 《★doing はもと a‐doing の a‐ の脱落したもの; 【用法】 doing にはスポーツ・娯楽活動などを表わす動詞がくる; 従って go studying [working] は間違い; cf. 自動詞 A18》. go skiing [hiking, walking, dancing, hunting, swimming, shopping, sightseeing] スキー[ハイキング, 散歩, ダンス, 狩り, 泳ぎ, 買い物, 見物]に行く. My father often goes fishing in this river. 父はよくこの川へ釣りに行く 《★【比較】 …goes fishing to the river. は間違い》. 〔+(to) do〕〈…しに〉行く 《★【用法】 《米口語》 では現在時制の場合 to なしの原形がくることがある; また go and do にもなる; ⇒GO and do 【成句】》. I'll go wake them in a minute. すぐに彼らを起こしに行きます. This train goes between Glasgow and Edinburgh. この列車はグラスゴーとエジンバラの間を走っている. The train is going along the valley. 列車は谷間ぞいを走っている. Go 10 miles along [down] this road. この道を 10 マイル進んでください. The car's going too fast [90 miles an hour]. 車は速すぎる[時速 90 マイルで走っている]. We can talk as we go. 歩きながら話せます. go by rail [ship, air, car, sea] 列車で[船で, 空路を, 陸路を, 海路を]行く 《★【用法】 交通手段を表わす by の次の名詞は無冠詞》. go on foot 《★無冠詞; 【比較】 walk のほうが一般的》. go on horseback 馬で行く 《★無冠詞》. go by bicycle [on a bicycle] 自転車で行く 《★by go は無冠詞》. It's time to go. 行く時間だ. Well, I must go [be going] now. さあ, もう失礼しなければならない. He came at two and went at five. 彼は 2 時に来て 5 時に帰っていった. She went off without saying good‐bye. 彼女はさようならも言わないで去った. Where do we go from here? ここからどこへ行くか; 次は何をするか. One, two, three, go! 1, 2, 3,それっ[どん]! 《★【比較】 スタートの合図で, Ready, steady [On your mark, get set], go! 位置について, 用意, どん! ともいう》. Two hours went by without my noticing. いつのまにか 2 時間たっていた. in days gone by 以前は. The ball went through the window. ボールは窓を抜けて飛んでいった. The message went by fax. その伝言はファックスで送られた. The prize went to his rival. 賞は彼の競争相手の手に帰した. Victory does not necessarily go to the strong. 勝利はいつも強者のものとは限らない. The eggs went for [at] 30 pence [a high price]. 卵は 30 ペンス[高い値]で売れた. How much did it go for? いくらで売れた? The house went very cheaply [cheap] at auction. 家は競売で非常に安く売られた. Going, going, gone (for ten thousand dollars)! さあもう一つ, もう一つだ, それ(1 万ドルで)売った! 《せり売りでの掛け声》. Her money goes on [for] clothes. 彼女の金は衣服に費やされる. Most of his time goes in watching TV. 彼は大半の時間はテレビを見て過ごす. This money goes to charity. この金は慈善にまわる. This money will go to build a new church. この金は新しい教会を建設するのに使われることになろう. Reference books go here [on this shelf]. 参考図書はここに[この棚に]入る. Where do the knives go? ナイフはどこにしまうのですか. This letter won't go into the envelope. この手紙は封筒に入らない. The coat won't go round him. このコートは小さくて彼には着られまい. Six goes into twelve twice.＝Six into twelve goes twice. 6で 12 を割れば 2 になる. How many pence go to the pound? 何ペンスで 1 ポンドになりますか. [通例 must，have to，can の後に用いて] 放棄される，廃止される，手放される. That paragraph will have to go. そのパラグラフは除く必要があろう. The pain has gone (away) now. 痛みはもうなくなった. All my money has [is] gone. お金が全部なくなってしまった 《★【用法】 be gone で完了後の状態を表わす》. Where has my watch gone (to)? 私の時計はどこへ行ったのだろう. Poor Tom has [is] gone. かわいそうにトムは死んだ 《★【用法】 be gone で完了後の状態を表わす》. His sight is going. 彼は視力を失いかけている. The bulb has gone. 電球が切れた. I thought the tree would go any minute. 木が今にも折れるかと思った. “How far [Where] does this road go? "—“It goes to Tokyo." 「この道路はどこまで行って[どこに通じて]いますか」「この道路は東京まで行って[に通じて]います」. This cord won't go as far as the wall outlet. このコードは壁のコンセントまで届かないだろう. His hand went to his glass. 彼の手がグラスに伸びた. go to a lot of trouble for a person 人のために大いに骨を折る. He'll go (up) to [as high as] eighty dollars for it. 彼はそれに 80 ドルまで出すだろう. My money will not go so far. 私のお金はそんなにもたないだろう. Camels can go for weeks without water. ラクダは水がなくても何週間も過ごせる. The clock isn't going. 時計が止まっている. All went well [smoothly]. 万事調子がよかった. The gun went bang. 大砲がズドンと鳴った. There goes the bell. ほら鐘が鳴る. Your ears go pop when you're landing in an airplane. 飛行機で着陸するときに耳がポンと鳴る. While speaking, he went like this (with his hands). 彼は話しながらこんな具合に(手まねを)した. There you go again. ほらまた始まった. There I go again. またやっちゃった. I tried to keep going. (努力して)仕事[活動]を続けようとした. He went according to the rules. 彼は規則どおりに行動した. make a party go 会を(活気あるものにして)成功させる. Let it go. そのままにしておけ, 放っておけ. The new manager will make things go. 今度の経営者は仕事をてきぱきやっていくだろう. How are things going? 形勢はどうですか; ごきげんいかがですか. Everything went well [badly] (with him). (彼には)万事うまく[まずく]いった. The election went for [against] him. 選挙は彼に有利[不利]に終わった. That hat doesn't go with your shoes. その帽子は靴と合わない. Is there an envelope to go with this notepaper? この便箋(びんせん)に合う封筒がありますか. go by the rules 規則どおりにやる. Promotion goes by seniority. 昇進は年功序列による. [as の導く節に用いて] 一般に(…で)ある(が), …並みから言う(と), 普通の…と比べる(と) 《★【用法】 主語には通例 不可算名詞 の名詞か複数名詞がくる》. as the world goes 世間並みには. It's rather cheap as prices go nowadays. それは最近の値段としてはむしろ安い. as the proverb [saying] goes 諺にもあるとおり. How does the first line go? 1行目はどうなっているか. The story went (something) like this. 話は(大体)こんなふうになっていた. The story [report] goes that…. 話[うわさ]では…である. Dollars go anywhere (in the world). ドルは(世界中)どこでも通用する. He goes by the name of Rob. 彼はロブの名で通っている. Anything goes (here). (ここでは)何でも認められる, 何をしてもよい. What I say goes, so stop arguing. ぼくの言うことが通る(べきな)んだ. だから文句を言うな. What I told him goes for you too. 彼に言ったことは君にも言える. She thinks it's an unwise decision, and that goes for me too. 彼女はそう決めては利口でないと思っているが, 私も同感だ. That only goes to prove [show] that I'm right. それで私が正しいことがはっきりするだけだ. Decisiveness is one of the qualities that go to make a good businessman. 決断力はすぐれた実業家を作りあげる資質の一つである. the qualities that go to the making of a scientist 科学者の形成に役立つ資質. go to court [law] 訴訟を起こす. go to war 武力に訴える, 戦争を始める. When I went to get up from the chair, I felt a pain. いすから立ち上がろうとした時痛みを覚えた. 〔+doing〕《口語》 [しばしば非難・軽蔑の意をこめて; 通例否定・疑問文で] 〈…する〉ような(ばかな)ことをする (cf. 自動詞 A1d). Don't go breaking any more things. これ以上ものを壊すようなまねはおよし. Why should you go poking around my home? どうして私の家を調べ回ったりするんだ. go on the stage 俳優になる. go to the bar 弁護士になる. All the eggs went bad. 卵がみな腐った. The tire has gone flat. タイヤがぺしゃんこになった. He went gray [bald]. 彼は髪が白くなった[頭がはげた]. go into fits of laughter わっと笑いだす. go into deep thought 考え込む. go into a coma 昏睡(こんすい)状態に陥る. go from bad to worse ますます悪化する. go Communist [Labour, Democrat] 共産主義化する[労働党側になる, 民主党につく]. 〔+補語〕〈人が〉 (しばしば習慣的に) 〈…で〉ある 《★【用法】 習慣を表わす時には always，often，used to などが用いられる》. They always go naked [hatless]. 彼らはいつも裸[無帽]で過ごしている. go hungry [thirsty, armed] 飢えて[のどが渇いて, 武装して]いる. [go one's way で] 行く，出て行く. I can't go this arrangement. この取り決めには承服できない. I'll go (you) a dollar on the outcome of the game. この勝負に(君と) 1 ドル賭けよう. Then he goes to me, “Over my dead body!" それで「おれの目の黒いうちはだめだ」と彼は言う. gò fífty‐fífty Gó flý a kíte! gò ón for… Gò ón (with you)! Gò to héll! Gó to it! to gò [《主に英国で用いられる》 be gòing] ón with Whó góes thére? He had another go [several goes] at opening the bottle. 彼はもう一度[何度か]瓶を開けようとした. I read the book at [in] one go. その本を一気に読んだ. He passed the test (at the) first go. 彼は一度で試験に及第した. It's your go next. 次は君の番だ. It's a sure go. 成功間違いなしだ. make a go of (one's) marriage 結婚してうまくいく. It's no go. だめだ, うまくいかない. It's a queer [rum] go. 妙な[困った]ことだ. I want to talk more, but I must be going. By the time I arrived at the station, she had already gone. She came at 9 a.m. and went at 2 p.m. The next train goes at 8: 40. That old custom will go sooner or later. He has a problem with his personality. So he has to go. Her eyesight will go in the near future. He is ninety‐two, and his mind is going. My jacket has gone at the elbows. The light bulb has gone. I have a terrible sore throat, and my voice has gone. She has gone at the age of 87. On your marks. Ready. Go! About ready to go now. Stay here until the bell goes. He's going too fast. I'll tell him to slow down. She went sobbing down the slope. My watch has stopped going. My pulse is going quickly. I can't get my car going. The rumor goes that the princess is seriously sick. The seeds of this flower go everywhere. “How did your interview go? "“I guess it went all right." The election went badly for the ruling party. Many children are still going hungry. “Some were in jeans, and others were in cocktail dresses."“Yeah. Anything goes these days." His new book is going well. The story goes that man hit the jackpot. Is there any coffee going? My father went to Fukuoka on business. There's a party at his house. Are you going ? I went to the movie with a couple of friends. Mother goes to work by bicycle. I'll go to see my aunt tomorrow. She decided to go to hospital. You should go to the doctor's. I want this memo to go to all teachers in this school. If something goes wrong, I'll lose my license. I would go crazy if I was all alone here. You can invite your friends. But don't go wild. Those cups all go in the top shelf. Where do you want this table to go? Ladies and gentlemen, this mirror goes to the lady in the blue jacket there. Most of her salary goes on clothes. The money will go to build a new bridge in the village. The results of the experiment all go to support my hypothesis. To get that vase, I'll go to 30,000 yen and no higher. They should go metric too. I could go a glass of wine. go about cleaning up the room. He's going about with an undesirable crowd. He was going after the prize. She felt as if she had gone against everybody. Everything has gone ahead as we planned. “May I use your phone?"“Sure. Go ahead." I made the poem up as I went along. Things are going along well. He went around the office introducing himself to people. How long have Ed and Jane been going around together? They went at each other emotionally. Go away! I hate you. I'd like to go back to my younger days. Now I'd like to go back to the main topic. I went back on my parents and quit school. Children often go beyond what is given. I just saw her car go by. Don't let this opportunity go by. I like watching the sun go down over the ocean. Prices are still going down. I don't go for this kind of music. The same story goes for my case. My bag is so full; nothing else goes in. My key won't go in the lock. I go in for baseball. He goes in for teaching English. This morning the smoke alarm went off. The balloon went off in his face. The negotiation went off well. He went off with our money. Don't stop. Go on reading. As time went on, she grew prettier. There are a lot of changes going on here. Let's go on to another subject. After university, he went on a composition course. Let's go over to Mary's house for lunch. He went over the material. The project went over very well with the committee. You have to go through immigration. She went through a lot as a girl. The police went through all his belongings. Now please go to the chart on page 5. The higher we go up, the thinner becomes the air. “How do you like my new tie? "“It's very nice, but it doesn't go with your jacket." White wines go with fish. It's too late for lunch. I have to go without. He is a first‐rate musician, as musicians go. I'm going to visit you this weekend. She's going to have a baby this coming March. I think it is going to rain this afternoon, so take your umbrella. Would you go get me a glass of milk? I've got to go and find a place to live. If you have a chance to study abroad, you should go for it. Go to it! Don't back off. Go where you will, you can't succeed without effort. You are kind, flexible, and active. You have a lot going for you. I'm almost through the novel. Only 3 pages to go. 成句Where does| a person |go from here? Now I've lost everything. Where do I go from here? He gave it a go. My mother is full of go. I don't know how to make a cake. I'll have a go . It's all go in the factory. Leave go of my arm! I've been on the go for a week. All the engines are go. She came at nine a.m. and went at two p.m. The next train goes at 8:40. He is ninety-two, and his mind is going. "How did your interview go?" "I guess it went all right." The story goes (that) that man hit the jackpot. "I chose the right man, " she goes. "Some were in jeans, and others were in cocktail dresses." "Yeah. Anything goes these days." He went into an abandaned building. There's a party at Ueno Park. Are you going (to the party)? She decided to go to (the) hospital. 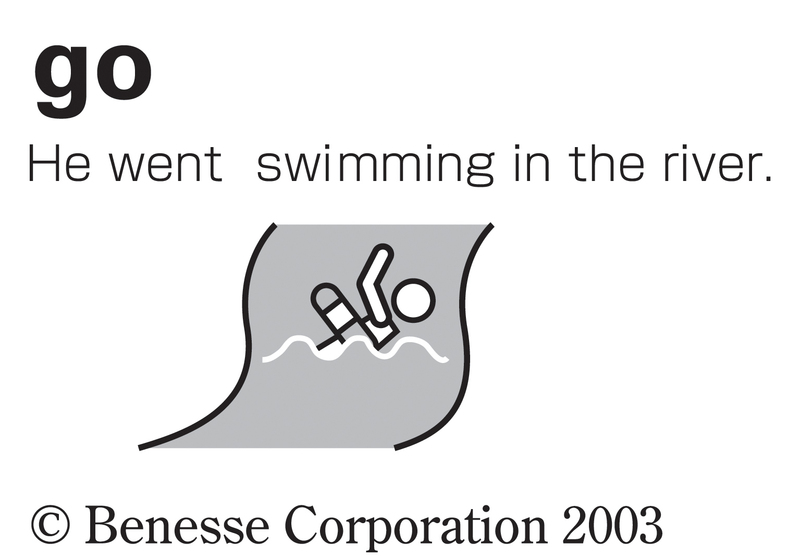 【語法】He went for a swim in the river. は「川に泳ぎに行った」ということだが,for の対象は a swim in the riverであり,「川に行く」ということではない.同様に,go doing は「...しに行く」といってもただ行くだけではなく「実際に...をする」という意がある.そこで We went swimming in the lake. には We swam in the lake. という含意がある.He went for a swim in the river.も同様である.He went to the river to go swimming[to go for a swim]も可能な表現である. He has a huge house, with the garden going down to the river. I don't know where my money goes. To get that vase, I'll go to 30, 000 yen and no higher. I'll go twenty (on the race). I'm not sure how to go about cleaning up this messy room. "May I use your phone?" "Sure. Go ahead." Children go beyond what is given. He went down with the flu. "What would you like?" "I'd go for a chicken." My bag is so full; nothing else goes in . We heard a rifle go off in the distance. Don' t stop. Go on reading. I'm going on for 50. All the candles went out when she blew on them. I went over the material but didn't give any comment. Okay, let's go over your story one more time. I went through a lot as a girl. The engineers went through the project in the hot and humid weather. "How do you like my new tie?" "It's very nice, but it doesn't go with your jacket." White wines goes with fish. It's too late for lunch. You have to go without. He is a first-rated musician, as musicians go. I think it is going to rain this afternoon, so please take your umbrella. Would you go (and) get me a glass of milk? Don't go getting yourself into trouble! You are kind, flexible, and active.You have a lot going for you. You would think my son runs this house; whatever he says goes. Where does a person go from here? government 《domain 名の一つ; 政府関連機関を表わす; cf. gov》. A button on the address bar that enables the user to navigate to the specified location (such as a folder path or web address). How is it going? それの調子はどうですか? From Middle English gon, goon, from 古期英語 gān (“to go”), from Proto-Germanic *gāną (“to go”), from Proto-Indo-European *ǵʰeh₁- (“to leave”). The inherited past tense form yode (compare 古期英語 ēode) was replaced through suppletion in the 15th century by went, from 古期英語 wendan (“to go, depart, wend”). 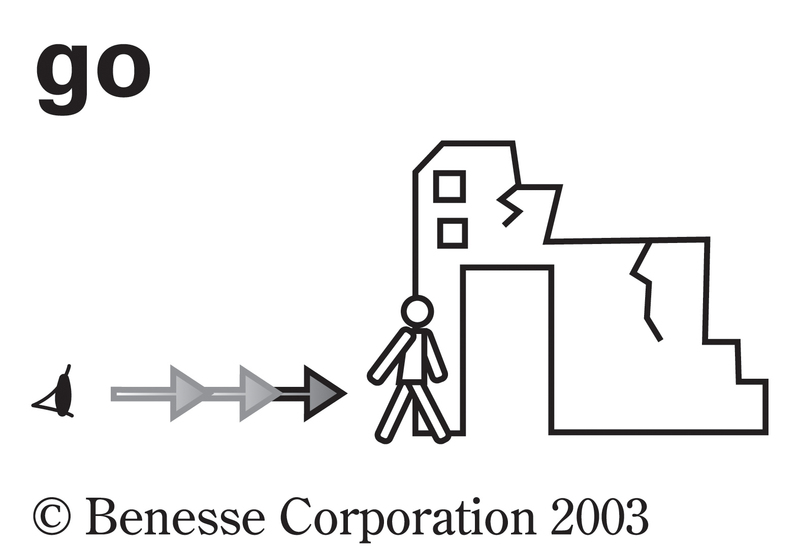 (intransitive) To move through space (especially to または through a place). (May be used of tangible things like people または cars, または intangible things like moods または information.) syn. ant. transl. Why don’t you go with us? This train goes through Cincinnati on its way to Chicago. Chris, where are you going? There's no public transit where I'm going. Wow, look at him go! You have to go all the way back to Herbert Hoover to see a performance in the Standard & Poors 500 equal to what we are experiencing right now. "I don't know how to tell you this, Aubrey, but you can't go back to 1938 […] the program won't accept any date that I input before 1941." […] "Well, I'll go to 1941, then." Yesterday was the second-wettest day on record; you have to go all the way back to 1896 to find a day when more rain fell. Fans want to see the Twelfth Doctor go to the 51st century to visit River in the library. 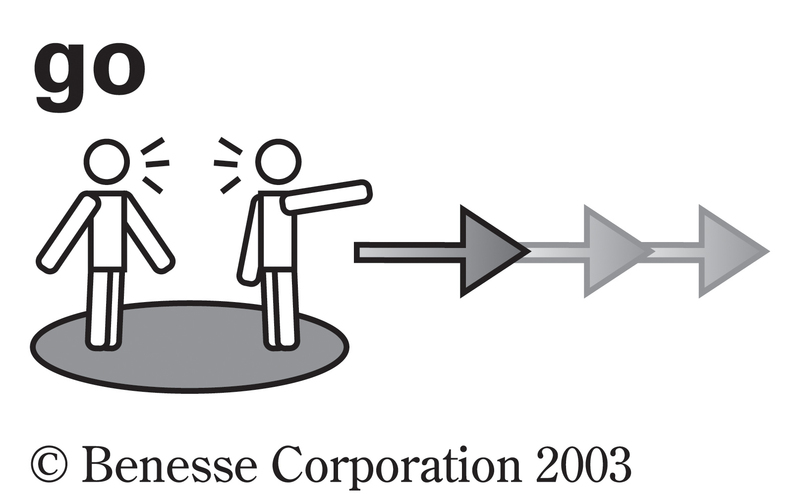 (intransitive) To navigate (to a file または folder on a computer, a site on the internet, a memory, etc). To access Office-related TechNet resources, go to www.microsoft.com/technet/prodtechnol/office. Go to your earliest memory and to your favorite one, then to one that's difficult to consider. Go to drive C: through My Computer (または Computer in Windows 7 かつ Vista) and double-click the c:\data folder. To move (a particular distance, または in a particular fashion). The car went a short distance, then halted. There was something wrong with the carburetor. We've only gone twenty miles today. This car can go circles around that one. (intransitive) To move or travel in order to do something, or to do something while moving. We went swimming. Let's go shopping. (intransitive) To leave; to move away. syn. ant. Please don't go! I really must be going. Workmen were coming and going at all hours of the night. Master Piercie our new President, was so sicke hee could neither goe nor stand. Other brunts I also look for; but this I have resolved on, to wit, to run when I can, to go when I cannot run, and to creep when I cannot go. (intransitive, chiefly of a machine) To work or function (properly); to move or perform (as required). syn. transl. The engine just won't go anymore. 'Although the lemon is now black and shrivelled the motor is still going strong. If I can make my small motor run for month after month on a single lemon, just imagine how much "juice" there must be in a whole sackful', Mr Ashill said. […] though his publisher swears black and blue that Kelder is still going strong and still remains an intensely private person. (intransitive) To start; to begin (an action または process). Get ready, get set, go! On your marks, get set, go! On your marks, set, go! Here goes nothing. Let's go and hunt. Be listening for my voice. Go when you hear my voice say go. (intransitive) To take a turn, especially in a game. syn. transl. I go to school at the schoolhouse. She went to Yale. They only go to church on Christmas. 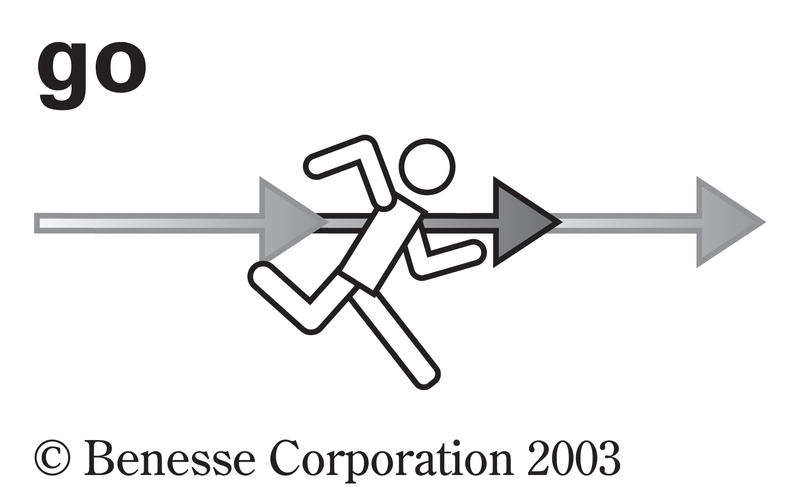 (intransitive) To proceed (often in a specified manner, indicating the perceived quality of an event または state). That went well. "How are things going?" "Not bad, thanks." I certainly won't mention it to Ben, and will go carefully if he mentions it to me. (intransitive, colloquial, with another verb, sometimes linked by かつ) To proceed (especially to do something foolish). Why'd you have to go do that? He just went and punched the guy. And even if she had believed the story about a John Smith, she might go telling everyone in town about what she'd seen. 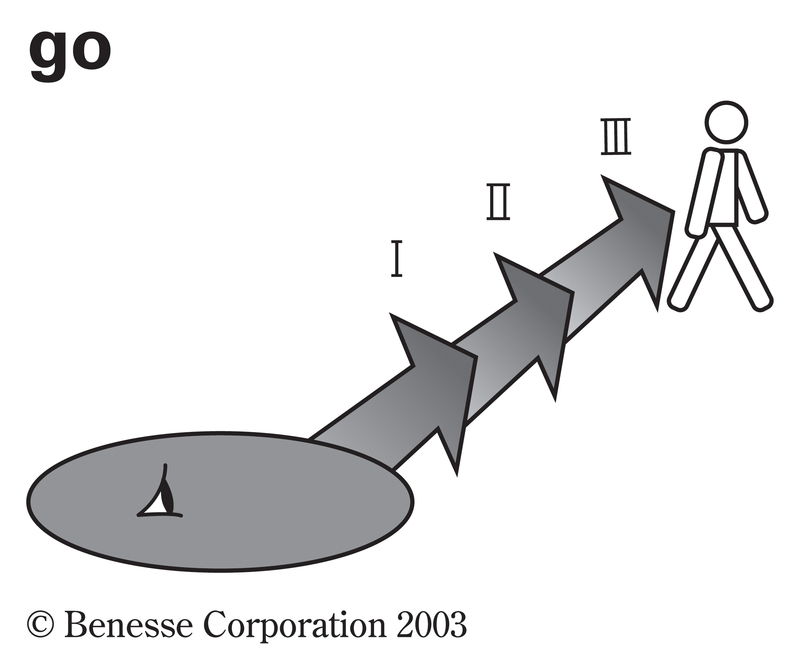 To follow or proceed according to (a course または path). I'm repeating it: I wish that you would go this path up to its end, that you shall find salvation! Let's go this way for a while. She was going that way anyway, so she offered to show him where it was. To travel or pass along. A shady promenade went the length of the street and the entrance to the hotel was a few steps back in the darkness, away from the glaring sunshine. 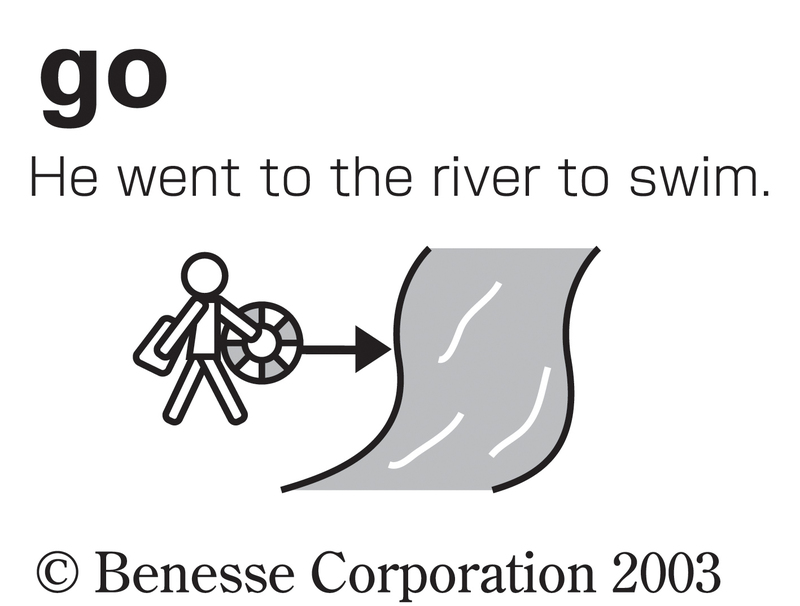 (intransitive) To extend (from one point in time または space to another). This property goes all the way to the state line. Even though they can give a basic fact such as 4 4, I don't know that this knowledge goes very deep for them. (intransitive) To lead (to a place); to give access to. Does this road go to Fort Smith? (copula) To become. (The adjective that follows usually describes a negative state.) syn. transl. You'll go blind. I went crazy / went mad. After failing as a criminal, he decided to go straight. Referring to the American radicals who went Hollywood in the 1930s, Abraham Polonsky argues that "you can't possibly explain the Hollywood communists away […] "